Spring was in the air, and for Amigos de los Animales that meant... PUPPIES! Late April we had two sets of puppies under 2 months of age at the Shelter: Blanqui's pups and Cookie's pups. But our mommy duties had just started. MAY RECAP: Puppies, Puppies and more Puppies! Late one Friday afternoon, we received a call from a good friend and volunteer. The news was that a homeless woman's dog was very pregnant but could not give birth. We immediately went to the rescue. 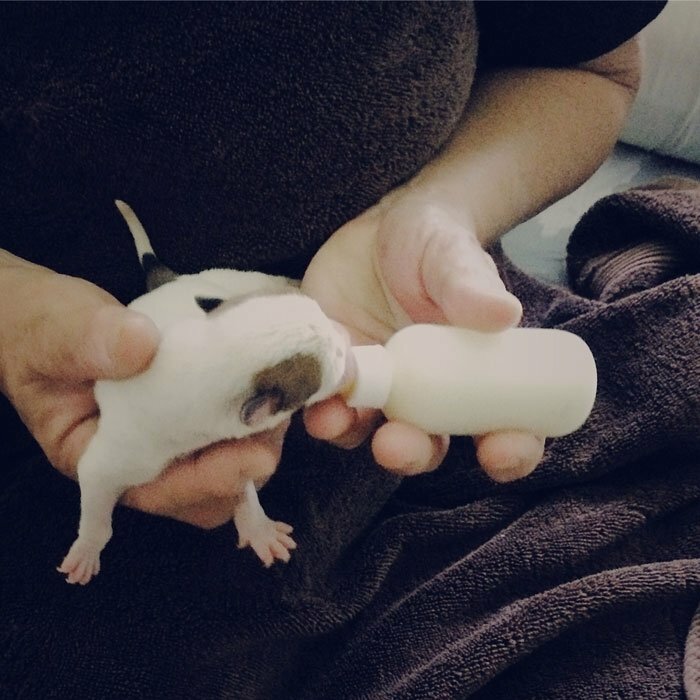 Manchita is a young female pitbull, who on April 20th gave birth by cesarean to 10 puppies. She could not feed the puppies, and These Babies URGENTLY needed a mom. We became just that. Adri fed these babies every 2 hours. Feeding was long and arduous, and there is a science to it! At first, the newborns preferred small nozzle bottles, and little by little graduated to thicker nozzles. Some had more appetites than others, and pretty soon, we had pegged each with a personality and subsequently, a namesake. At one point we tried to get a substitute mom for the babies, but this did not work out. Watch the video of our attempt to get Mimi acquainted with the pups! Adri was scared for the survival of all 10 puppies, but we only had one which needed some extra care to get through his first couple of weeks. Laureano Vitalicio (easily recognized because of the exclamation mark on his tail) went through colic distress on April 26, and had to be revived with Pedialyte and extra attention. From then on, Laureano was pampered and given the royal treatment by Adri: eating first, sometimes refeeding, and extra cuddles! A picture tells a thousand words, and a video even more. We thought it best to document the puppies' journey with us, and the volunteers that came to give their support! Watch our Playlist on Youtube! 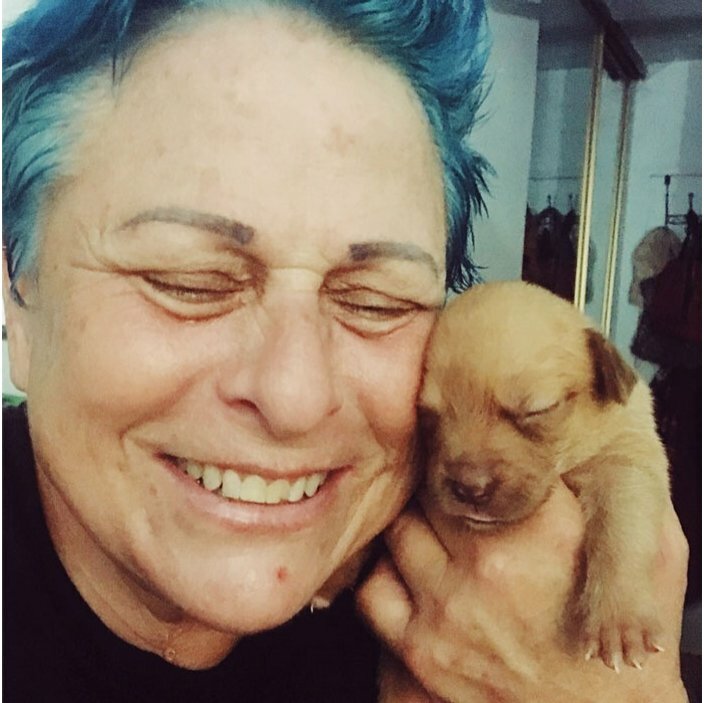 For more videos and photos of Manchita's puppies (as well as other Shelter news), follow us on Facebook, Instagram and Twitter. The puppies are now coming upon their third month of life and we look forward to sending them to a Sister Shelter in the United States as soon as they are ready to fly! WE RELY ON YOUR DONATIONS TO HELP PUPPIES JUST LIKE MANCHITA'S. Amigos de los Animales (ADLA) rescues, rehabilitates and rehomes abused and abandoned animals in the island of Puerto Rico. ADLA operates a Shelter located in Piñones, Loiza. We rescue dogs from the streets or the beach, rehabilitate them, vaccinate and sterilize, and get them adopted or transport them to no-kill Shelters in the mainland United States. We depend on tax-exempt donations and volunteer support to complete our mission and our rescues.